And the response: What better way to get answers? From an early age we are taught that asking good questions is the best means of obtaining information, gaining clarity, learning, challenging assumptions or simply gathering more content and context. 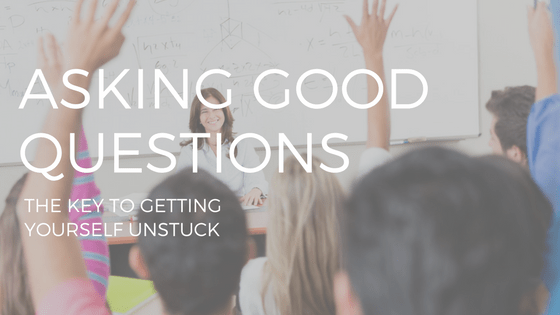 There are times when asking good questions is the very best way of resolving conflict, removing barriers and propelling ourselves forward even when the forces of the world appear to have conspired to push us backwards. As I’ve mentioned many times on this blog, in order for things to change, we have to change. In order for things to get better, we must get better. Change and getting better entails replacing existing habits with new ones that will, over time, propel us to where we wish to be. And one of the most guiding of all habits is The Habit of Asking Good Questions. All too often, when we find ourselves in places we never wanted to visit, facing adversity unlike anything we have experienced before or dealing with challenges we could not have imagined, we tend to invest our time focusing on the negative situation itself. Time can almost always be better spent directing our energy into finding the best way out. Asking good questions is a key way of doing this. We allow our attention to be drawn to the present situation and frequently devote significant amounts of time to revisiting our position, discussing it with others or we simply find ourselves dejected and, ultimately, convince ourselves there is no way out. All questions produce answers. Unfortunately, the answers to these types of questions will do nothing more than drive you even deeper into a dark place. We reflect on the unfairness of our circumstances and sap our energy by focusing on all the negatives these new conditions have brought to our lives. It is at these times that The Habit of Asking Good Questions paves the way for us to begin moving away from our present status and replacing it with a much more desirable one. It is said that if we ask the right questions, we will always get the right answers, the right questions are of course those that enable us to direct our focus, energy and effort to where we want to be rather than concentrating on where we are and how we got there. Consider these questions when next you find yourself someplace you don’t want to be. What is one thing I can do right now, this moment to improve my situation? What is my action plan for the next two weeks to place myself squarely on the pathway to where I want to be? Who do I need to connect with or interact with to help achieve my goals? How will I put in place the resources I need to do this, and when will I have this completed? What new skills or knowledge do I need to acquire for this to happen and how am I going to acquire these skills? What must I work on every day to become better? What exactly did I do that allowed this situation to exist in the first place? These types of questions are empowering, for they enable us to de-victimize ourselves, take full ownership of where we are and place us in control of our own destiny. These questions enable us to become our own “turnaround specialist” by encouraging us to design a blueprint for where we want to be and then identifying the actions necessary to get us there. They instantly take a problem and reframe it into a goal. The Habit of Asking Good Questions should be firmly entrenched in each of us for without it we run the risk of allowing self-pity, despondency and, worst of all, a sense of helplessness to overcome us and keep us forever grounded in where we don’t want to be. So, if it is true that the best way of getting answers is by asking questions, then it stands to reason that the more intelligent the questions, the more intelligent the answers. And the more intelligent the answers, the more likely we are to take positive action. When exactly are you going to start?